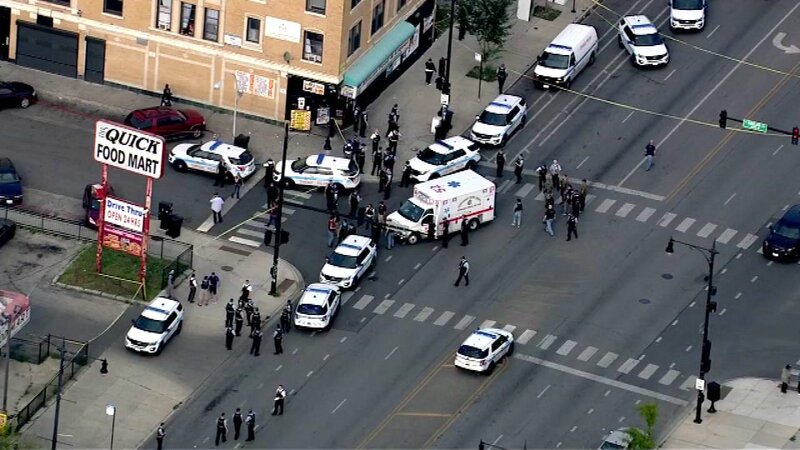 CHICAGO (WLS) -- Chicago police officers reportedly shot at a suspect Thursday after he opened fire on another man in West Garfield Park. According to a police statement, the officers witnessed a verbal altercation in the 4200 block of West Madison Street at approximately 5 p.m. The situation escalated into a shooting, and police engaged the gunman, discharging multiple rounds, police said. Police said the officers did not hit the gunman. According to a police statement, one suspect is in custody and two weapons were recovered. During the incident, a vehicle was shot and a 9-year-old boy was injured by glass, police said. Police said they believe the vehicle was hit during the first altercation. Shortly after the encounter, a man arrived at an area hospital with a gunshot wound to his lower body, according to officials. The circumstances of his injury are under investigation. The officers were uninjured and have been placed on routine administrative duties for 30 days. Surveillance video will be reviewed to corroborate the timeline of the incident.